To spark discussion, the Walker invites local artists and critics to write overnight reviews of our performances. The ongoing Re:View series shares a diverse array of independent voices and opinions; it doesn’t reflect the views or opinions of the Walker or its curators. Today, Penelope Freeh shares her perspective on Friday night’s Proscenium Works 1979-2011 by Trisha Brown Dance Company. Agree or disagree? Feel free to share your thoughts in comments! Trisha Brown Dance Company, after this 3-year tour of eight seminal proscenium works is complete, will redefine its mission, which includes dismantling these works. The company’s new direction includes installing interactive archives with as-yet-to-be-announced partner spaces (museums and the like) and will maintain a non-proscenium performing presence along with other modes of audience engagement. It’s essential to see work live that will never be done again, most especially by longtime practitioners of said work. These dancers bring these works to life in such a special and specific way. There is no ornamentation, no put on style or aesthetic to detract from the ever-changing forms and fluid passages. The aesthetic is in fact bare and almost quotidian if it wasn’t so dancerly. There were four works on this particular program spanning 1983-2011. A fantastic overview though it made for a long evening. First up was the rather glorious Set and Reset whose flow was only rarely interrupted by an arrested pose or lift, usually in a flex-footed open run position. Robert Rauschenberg created the visual presentation and costumes, which included see-through wings. These were used to great and subtle effect, adding another ephemeral element to an inherently ephemeral form. The flowing costumes were of the same fabric, with silk-screened images in black, white and grey. I assume these echoed the ever-present video installation that hovered above the dancing space, conjuring a sense of time passing, history and dream-like nostalgia. Individually and in groups forms melted away as soon as they were made manifest. The driving score by Laurie Anderson contributed to the sense of never-endingness. Just when a movement would register another would take its place, catapulting into a new flow and another seamless interruption. While Set and Reset encapsulated many of the company’s overarching qualities and capabilities, Astral Convertible got more specific. With more visual elements from Rauschenberg including towers of light decorating and defining the space, this work was very formed and architectural. Dancers too were used as decorative and space-defining elements as others moved through and over them. Floor-bound bodies folded and unfolded, quietly cueing with the word “go”, adding nicely to the minimalist score by John Cage. In this world there were more moments of isolation for individual or a few dancers. Contact and partnering felt more emotional as connections were attempted and sometimes made awkward with mechanical motions bumping against the organic. If you couldn’t see me was solo for a female, accomplished entirely with her back to the audience. Performed by Cecily Campbell, the material had room for personal élan and choice-making. Interesting, since we never saw her face. The lighting and costume rendered her back as expressive as a face, her ribs and muscles hyper-articulate. The last work on the program and in the proscenium repertoire in general was I’m going to toss my arms – if you catch them they’re yours. This was a poignant watch, knowing it’s Brown’s last work of its kind. Burt Barr, longtime partner of Brown, designed the visual presentation, comprised here of many large industrial fans. The dancers, wearing baggy white tops and pants, begin among them, situated stage left. Clothing gets blown off some, pulled off by others, another nod at ephemera laced with a little bit of danger. With a score by Alvin Curran, it was a great treat to hear and see him live on piano. In various states of undress for much of the work, the dancers settled into a comfort zone of close calls, forms competing to occupy the same space, gently making contact long enough to leverage a launch away. For this as in all the works on view, the music served as a landscape and not a specific set of directions. This use of music perhaps defines the work as post modern more than any other element, many of which might be considered classical: the segregated costuming for the sexes; the highly structured nature of the dances; the awareness of front, the audience, indeed, the proscenium. But the use of music is what defamiliarises us with watching this work. Because the dance isn’t bonded, in a traditional sense, to the music, we end up viewing it differently. The steps call out to us of their own accord, asking to be viewed for their own sake. Steps lay atop the sound scores for all these works and we are asked to multitask. The watching and listening are on two tracks, each getting a democratic treatment. I wish this great and historic company well, on the remainder of this tour and for their future endeavors. It’s a brave thing to dismantle, to leave behind, to let one’s personal ephemera fade away. But as any dancer can attest, it’s simply what we do. 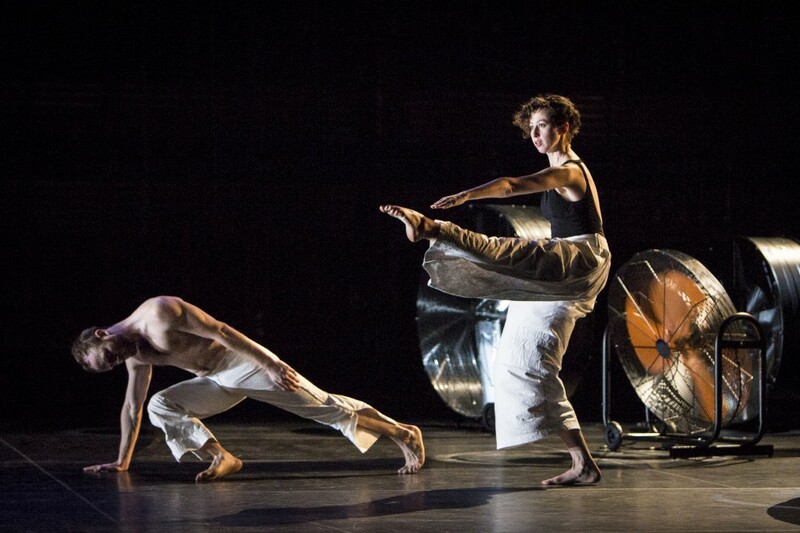 Trisha Brown Dance Company performs Proscenium Works: 1979-2011 in the McGuire Theater March 12-15.